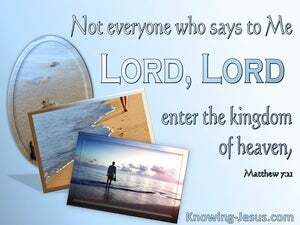 ﻿ Matthew 7:21 "Not everyone who keeps saying to me, "Lord, Lord,' will get into the kingdom from heaven, but only the person who keeps doing the will of my Father in heaven. "Not everyone who says to Me, 'Lord, Lord!' 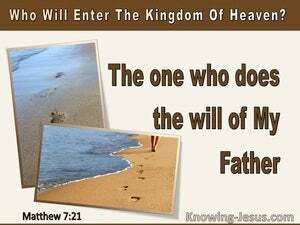 will enter the kingdom of heaven, but [only] the one who does the will of My Father in heaven. Not every man who says to me, Lord, Lord, will enter into the kingdom of the heavens, but he who does the will of my Father in the heavens. "Not every person who says to me, 'Lord, Lord,' will enter the kingdom of heaven; but [only] that person who does what my Father in heaven requires. Not every one that says to me, Lord, Lord, shall enter into the kingdom of heaven; but he that does the will of my Father who is in heaven. "Not every one who says to me, 'Lord, Lord,' shall enter the kingdom of heaven, but he who does the will of my Father who is in heaven. Not every one that says to me, Lord, Lord, shall enter into the kingdom of heaven: but only they who do the will of my Father who is in heaven. Not every one saying to me, Lord, Lord, shall enter into the kingdom of the heavens; but he that doeth the will of my Father who is in the heavens. It is not everyone who says to me 'Lord! Lord!' who will get into the Kingdom of Heaven, but only those who do the will of my Father in heaven. Not every one that saith to me, Lord, Lord, shall enter into the kingdom of heaven, but he that doth the will of my Father who is in heaven. Not every one that saith unto me, Lord, Lord, shall enter into the kingdom of the heavens, but he that doeth the will of my Father who is in the heavens. Not every one saying to me, Lord, Lord, shall enter into the kingdom of the heavens; but he doing the will of my Father who is in the heavens. Not every one that says unto me, Lord, Lord, shall enter into the kingdom of heaven; but he that does the will of my Father who is in heaven. "Not everyone who says to me, 'Lord, Lord,' will enter into the kingdom of heaven, but the one who does the will of my Father who is in heaven. Not everyone who says to Me, Lord! Lord! shall enter the kingdom of Heaven, but he who does the will of My Father in Heaven. "Not all they that say unto me, 'Lord, Lord,' shall enter in to the kingdom of heaven; but he that doeth my father's will which is in heaven. It is not everyone who says to me 'Lord, Lord! ', who will get into the Realm of heaven, but he who does the will of my Father in heaven. "Not everyone who says to me, 'Lord, Lord,' will enter into the kingdom of heaven, but he who does the will of my Father who is in heaven. "Not everyone who says to me, 'Lord, Lord,' will enter into the kingdom of heaven -- only the one who does the will of my Father in heaven. Not every one that saith to me, Lord, Lord, will enter into the kingdom of heaven; but he that doeth the will of my Father who is in heaven. 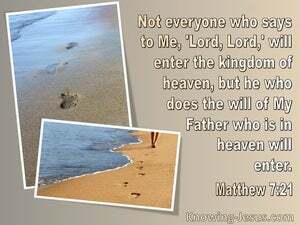 Not every one that says to me, Lord, Lord, shall enter into the kingdom of heaven, but he that does the will of my Father in heaven. Not every one that saith unto me, Lord! Lord! shall enter into the kingdom of the heavens, - but he that doeth the will of my Father who is in the heavens. Not every one who saith to me, Lord, Lord! shall enter into the kingdom of heaven; but he that doeth the will of my Father who is in heaven. Not every one who says to me 'Master! Master!' will enter the Kingdom of Heaven, but only he who does the will of my Father who is in Heaven. Not every one that saith to me, Lord, Lord, shall enter into the kingdom of heaven; but he that doeth the will of my Father who is in heaven. "Not every one who says to me, 'Master, Master,' will enter the Kingdom of the Heavens, but only those who are obedient to my Father who is in Heaven. Not everyone who says to me, 'Lord, Lord,' will get into the kingdom of heaven, but only those who practice doing the will of my Father in heaven. "Not every one who says to Me, 'Lord, Lord,' shall enter into the Kingdom of Heaven, but he that does the will of My Father in Heaven. 'Not every one who is saying to me Lord, lord, shall come into the reign of the heavens; but he who is doing the will of my Father who is in the heavens. For it is not merely those who hear the Law who are righteous in God's sight. No, it is those who follow the Law, who will be justified. Keep on being obedient to the word, and not merely being hearers who deceive themselves. because whoever does the will of my Father in heaven is my brother and sister and mother." "Listen to this, house of Jacob, you who are called by the name of Israel, and who have come forth from Judah's loins; you who swear oaths in the name of the LORD and invoke the God of Israel but not in truth, nor in good faith. Then Jesus told him, "How blessed you are, Simon son of Jonah, since flesh and blood has not revealed this to you, though my Father in heaven has. Again I tell you, it is easier for a camel to squeeze through the eye of a needle than for a rich person to get into the kingdom of God." His son replied, "I don't want to,' but later he changed his mind and went. But he said, "Instead, how blessed are those who hear God's word and obey it!" Indeed, it's easier for a camel to squeeze through the eye of a needle than for a rich person to get into the kingdom of God." This is my Father's will: That everyone who sees the Son and believes in him should have eternal life, and I will raise him to life on the last day." If anyone wants to do his will, he'll know whether this teaching is from God or whether I'm speaking on my own. The person who hates me also hates my Father. strengthening the disciples and encouraging them to continue in the faith. "We must endure many hardships," they said, "to get into the kingdom of God." Do not be conformed to this world, but continuously be transformed by the renewing of your minds so that you may be able to determine what God's will is what is proper, pleasing, and perfect. Do not do this only while you're being watched in order to please them, but be like slaves of the Messiah, who are determined to obey God's will. Epaphras, who is one of you, a servant of the Messiah Jesus, sends you his greetings. He is always wrestling in his prayers for you, so that you may stand mature, completely convinced of the entire will of God. For it is God's will that you be sanctified: You must abstain from sexual immorality. They claim to know God, but they deny him by their actions. They are detestable, disobedient, and disqualified to do anything good. equip you with everything good to do his will, accomplishing in us what pleases him through Jesus, the Messiah. To him be glory forever and ever! Amen. Do you want proof, you foolish person, that faith without actions is worthless? "How blessed are those who wash their robes so that they may have the right to the tree of life and may go through the gates into the city! "See to it that you do not despise one of these little ones, because I tell you, their angels in heaven always have access to my Father in heaven. This is how my heavenly Father will treat each one of you unless you forgive your brother from your hearts." Then Jesus looked around and told his disciples, "How hard it will be for those who are wealthy to enter the kingdom of God!" If you have known me, you will also know my Father. From now on you know him and have seen him." Going on a little farther, he fell on his face and prayed, "O my Father, if it is possible, let this cup pass from me. Yet not what I want but what you want." He went away a second time and prayed, "My Father, if this cup cannot go away unless I drink it, let your will be done." And if your eye causes you to sin, tear it out. It's better for you to enter the kingdom of God with one eye than to have two eyes and be thrown into hell. Then some Jews who went around trying to drive out demons attempted to use the name of the Lord Jesus on those who had evil spirits, saying, "I command you by that Jesus whom Paul preaches!"